New dates available in June! 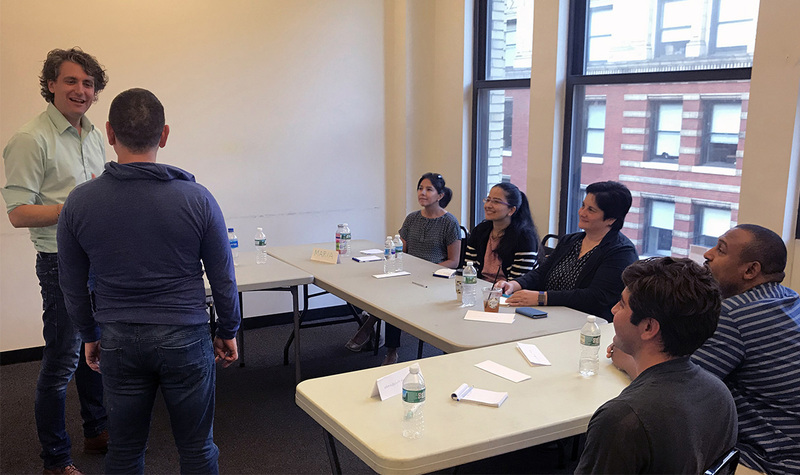 Join a public speaking course from Herman Otten in New York City! We offer open public speaking classes, in-company training for your company and private coaching. Last week I joined one of the public speaking classes from Herman. It used to be a huge struggle for me every time I had to give a presentation. It even kept me awake multiple nights before the actual presentation itself. Thanks to Herman’s enthusiasm, craftsmanship, and positive feedback my fear has disappeared to the background and I discovered what my strengths are in public speaking. For each individual Herman sees what’s necessary to let him or her grow. I was able to apply his personal tips immediately. Yesterday I gave a presentation at work and the audience loved it! Herman, thank you so much for this experience! I took a very pleasant public speaking course from Herman. In a positive and playful manner (and not in a bigger group than 6) Herman showed us how enjoyable public speaking can be. The quote that stuck with me from that day: “The best way to get over your fear of public speaking is to learn how to enjoy it.” Don’t prepare too much beforehand, that’s a sure way to mess up. I learned a lot from the technical tips and tricks and learn how to speak up louder!